Less than five minutes' drive away, there is Kerasia's 200m-long beach which is one of the best pebbly beaches in the area. The beach impresses with beautifully green, mountainous backdrop with olive and cypress trees. Located between Kalami and San Stefano, Kerasia is a perfectly relaxing spot in the afternoon sun. At Kerasia sun beds and umbrellas can be rented and there is one seaside taverna. Situated between the villages of San Stefano and Kassiopi, Avlaki is a very tranquil beach, pebbly with crystal clear water. At the beach there are sunbeds and a couple of beach-side taverns, also water sport facilities as windsurfing and dinghy sailing are available. At Avlaki, there is usually a welcoming refreshing sea breeze in the afternoon. Kassiopi is the busiest spot on the north-east coast, with plenty of shops, cafés, bars and several nice pebbly beaches away from the centre of Kassiopi resort. Kanoni Beach for instance, is a pretty beach with smooth rocks from where you can jump into the ctystal-clear waters. This beach also has a small sandy part on its left. Kalami Beach is a horseshoe-shaped bay, located just a 10 minutes drive from San Stefano. Kalami is famous for its natural beauty as well as for the 'White House' that is located at the end of the bay. It was from 1935-39 residence of the popular British authors Lawrence and Gerald Durrell and is today a guest house and tavern. The 'Blue Flag' awarded Kalami beach is pebbly and with crystal clear turquoise water. 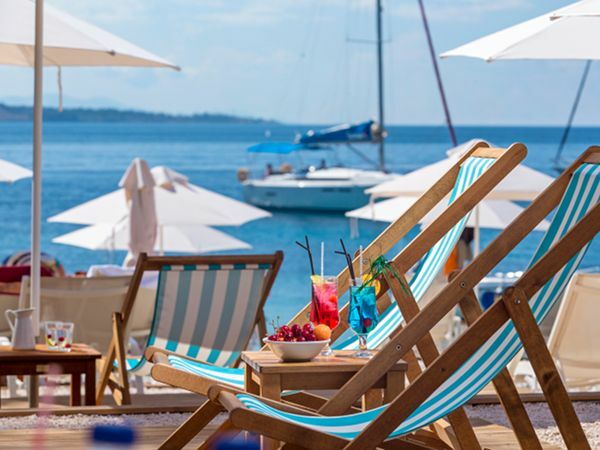 Sun beds and umbrellas are available, also seaside tavernas, small shops and water sport activities as sea cycling, canoeing, water-skiing and boat rental.